Rake - Does it mean additional downforce? This isn't a public service announcement regarding your common garden 'Rake' but a feature on the nose down phenomenon used in F1 referred to as 'Rake' (The term however more than likely owes it's heritage to the garden rake as pictured above). 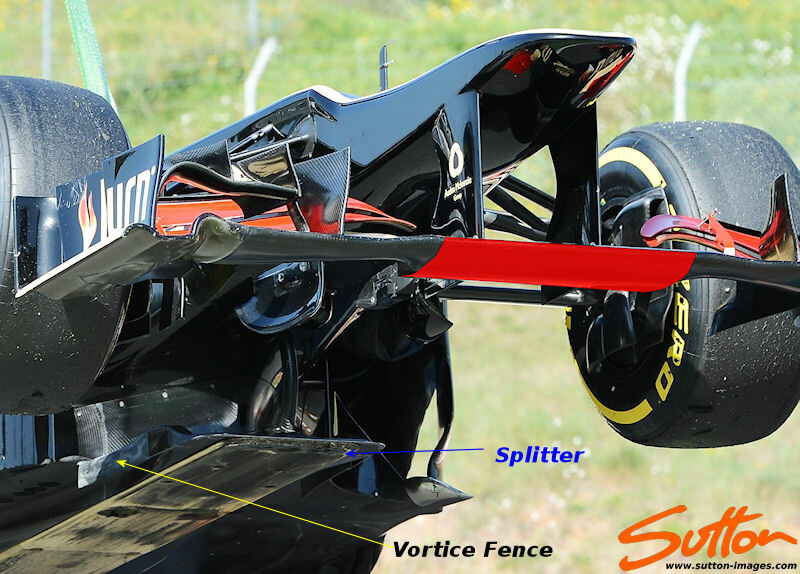 Creating downforce in F1 as we know is complex endeavor and requires one to think of the car as a whole rather than the sum of it's parts as by altering or achieving one effect can have a positive or detrimental effect elsewhere on the car. The word 'Rake' refers to the nose down pitch angle of the car and is most commonly referred to by the media as a sign of a team running with high rear end downforce. Above: As a means of showing the appoximated path of the exhaust plume wanted by the teams I've highlighted it in red on the MP4/28. Obviously the Brake Duct and Suspension obscure the gap between the floor and the diffuser but hopefully this goes some way to explaining what the teams are looking to achieve. So as I mentioned let's not try to think of 'Rake' in isolation and think of the other effects it has on the car. At the front of the car the nose down attitude created when raking the car drops the Front Wing into ground effect, as the wing gets closer to the ground the air accelerates increasing the downforce generated, whilst a vortex is generated at the joint between the wing and Endplate. This effect increases until such a point that the wing is so low that the ground and wings boundary layers combine reducing downforce and bursting the joint vortex. Obviously the rotating wheel behind the Front Wing has an impact of this effect and is the reason we see most teams turn out the Endplates to encourage the flow around the wheel. Meanwhile the Front Wing Cascades intercept some of the airflow above the wing flaps and by and injecting the airflow above the wing help to manage the airflow around the wheel. Moving to the central section of the Front Wing and it's onward effect with Rake and the combined effect of the Splitter during this ruleset: The Y250 section is the central section of the Front Wing's mainplane that is mandated in dimension to 500mm in width. It's design/construction is also mandated and so the teams have to find ways in which to control it's aerodynamic effects as although it is designed to be neutral of course in terms of aerodynamics nothing is. The only difference here is all the teams have to manage the same aero problem, a vortice is shed from either end of the section as the section changes profile. This vortice encloses the central portion of airflow between the pylons making moving airflow either side of it more difficult, it does however mean that air spilling from the tyres when cornering has a more difficult time impinging on the centralised flow. 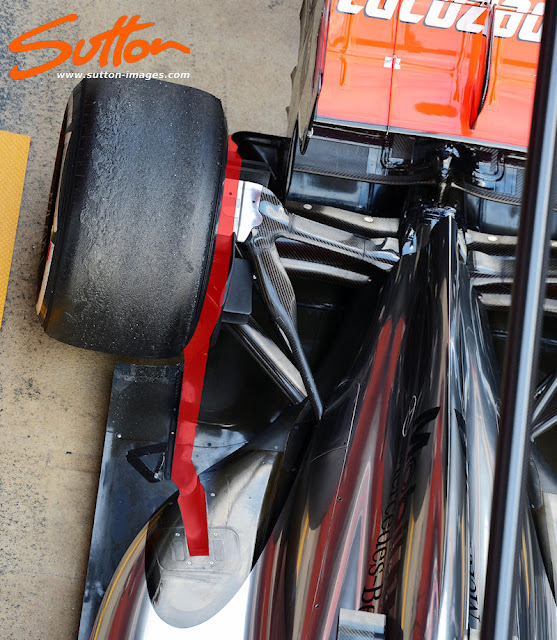 Although teams don't have the freedom to modify that section of the car, many have however taken the opportunity to place the FOM camera's behind the section which undoubtedly changes the characteristics in the central portion of the wing. (The FOM camera's are also regulated in size and shape, so no one team can glean an aerodynamic advantage from their placement) Red Bull's movement of the FOM camera's to the hammerhead position on the nose further suggests the team have gone to in order to tilt the Front Wing backward under aerodynamic load with the camera's being placed behind the Y250 section it could have had an undesired effect on the aero aft of it. Running with more Rake can become a problem for teams in qualifying and towards the end of the race as this is when the car is at it's lightest. The biggest issue comes under braking as the car pitches forward and can cause the Front Wing to either collide with the ground or Stall as it's range becomes too low to work aerodynamically. 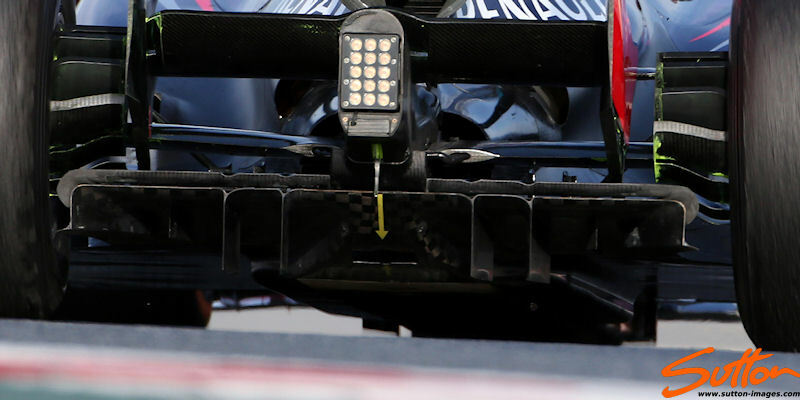 However moreover the problem comes from the Splitter as it is more likely to hit the track than the Front Wing and as we have already discussed, too much of this and it will wear the Skid Block resulting in a disqualification. The Splitter itself generally has a section at it's outer edge that is designed to take these Vortices and send them onward along the edge of the transition between the Step and Reference planes. Whilst the remainder of the vortices (higher) are managed by the Sidepod undercut etc. 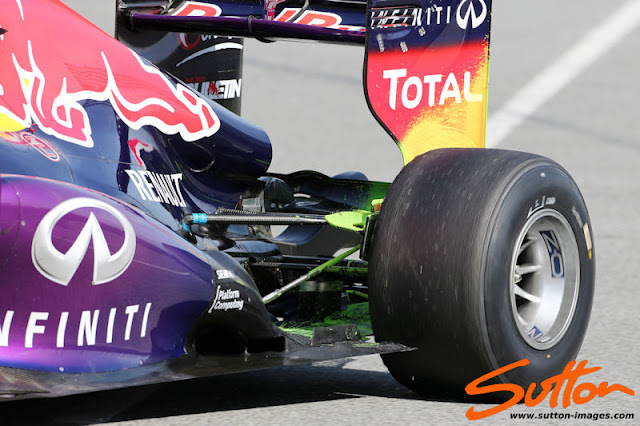 So how does increasing the Rake improve downforce? This is all based on the intensity of the exhaust plume being pumped between the rear wheel and Diffuser Strake. The exhaust plume acts as an extension of the Strake extending the Diffusers height whilst stopping airflow entering the Diffuser from the side and destroying the Vortex thereby increasing the available area of expansion for the Diffuser. The outer Sections of the Diffuser generally have their walls (outside edge) tapering outward to maximise the Difusers area meanwhile at least one more control Strake will sit inbound on the centralized channel in order to control the vortices that are being created at the outer edge. With Rake increased the requirement for the outer channels to be fed airflow is increased with the exhaust plume creating the most obvious interaction in the outer section just as was done when the rules permitted EBD. The exhaust plume (if directed correctly) not only fills the void between the tyre and the floor helping to 'Seal' the diffuser but ingresses into the outward channel helping to extract the airflow more quickly by enhancing the Vortex giving the effect of that region being closer to the ground. Airflow to the outer channels of the diffuser is also dealt with by the floor and so when using more Rake adaptations must be made here too in order to fully extract the benefits of larger expansion. This will lead to changes in the lower edge design of the Bargeboard (In Front of the Sidepod) along with other changes to the forward section of the floor. Furthermore changing philosophy to the way in which airflow migrates along the side of the floor will not only effect the car in yaw but increase the Diffusers performance too. Using Red Bull as an example (as they are a team that tend to increase the Rake in their cars) a new Floor Scroll has been added to the RB9 that features a perforated edge, this perforation will increase the areas efficiency and push aside the airflow that the wheels have dispatched of upstream. Rake can be identified as an increase in downforce, however the effects of Rake can either be scaled as marginal or large. The crossover point of running the diffuser in ground effect and at a higher height are relative to the 'Sealing' effect being created by the exhaust plume. It could be argued that it's a trade off unless you can successfully create a large enough effect from the exhaust plume to 'Seal' a much larger area of the Diffuser's edge or indeed enhance the vortex being created in the outer edge of the Diffuser aiding in flow attachment. With raised Rake you then also have to redesign / profile the rest of the cars design too. The 2011 variant of Blown Diffusers owed their success to the now banned off throttle maps and so creating that same 'Sealed' effect when the driver is entering the corner is the most difficult aspect for the teams to overcome when utilising additional rake. In the case of Red Bull (RB8/9) and now Lotus (E21) and Williams (FW35) we see the teams utilising Cross-Under Tunnels beneath their exhaust channels. These help to separate the airflow above the floor giving the exhaust plume a clearer pathway to the gap between the rear wheels whilst migrating the airflow coming around the Sidepods/floor into the more centralised coke bottle area via the tunnels. This allows a transitional period between on and off throttle, smoothing out the loss of downforce as the Diffuser is robbed of it's 'Sealing' skirt. Furthermore we have seen that throughout 2012 as Red Bull made revisions to the rest of their aero scheme they also changed the quantity/geometry of the Cross-Under tunnels which undoubtedly mirrors the other changes when considering centre of pressure. I suppose the other plausible solution to smoothing out the transition in downforce would be if the team could find a way in which to adjust the ride height of the car as it enters the braking phase. Lowering the car at the rear could lead to the Diffuser re-entering 'Ground Effect' and recovering some of the losses associated with the loss of downforce as the exhaust plume dissipates. This is obviously a difficult task as when the car brakes it will dive forward and so the teams would need a method of circumnavigating this to either raise the front of the car under braking or lower the rear. This is a method used in the active suspension days in order to keep the car in it's aero window and so is extremely difficult to replicate now but I do have a feeling we may be revisiting this topic soon. There must be hundreds of millions of dollars worth of research and knowledge on this subject in F1, I wonder if there will ever be a practical use for it outside F1. It's use in road cars is really nullified by the speed differentials at play. Most F1 aero is only relative at speeds over 120Kph and so it's usually sports/hyper cars that can use the knowledge to it's full effects.